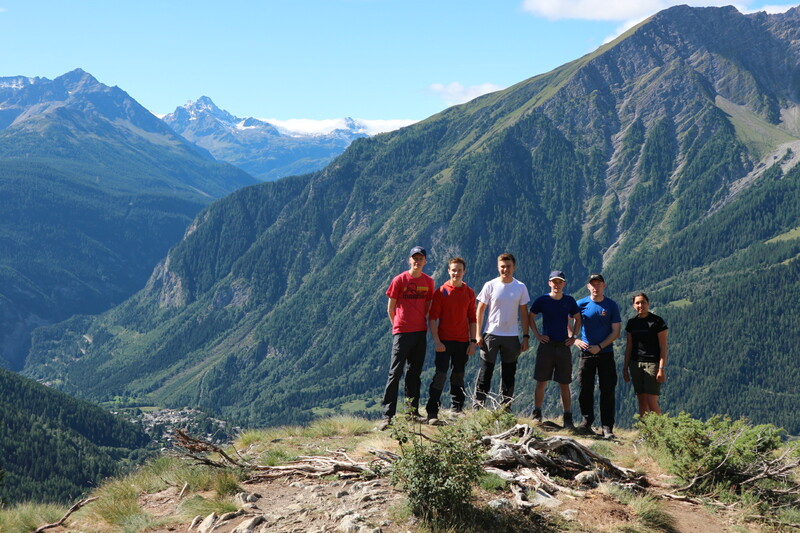 Exercise Thor’s Azure saw seven Officer Cadets from DTUS Thunderer Squadron undertake the Tour de Mont Blanc, a 171km mountaineering round trip in the Alps, starting in France and spanning across Italy and Switzerland before finishing back in France. The exercise began with an early start with the team setting out from Southampton in order to get to Dover to catch the ferry across to Calais. After getting lucky and boarding an earlier ferry than expected, we found ourselves facing a long drive down through France to reach Chamonix. Thankfully, the weather, for the moment, was holding up. After driving all day, we finally got some much-needed sleep before our first day. The first morning saw the team trying to create a breakfast using a jet-boil, and after failing rather miserably, decided to try and find better cooking equipment in Chamonix. The weather necessitated that no walking took place due to the forecasted frequency of thunderstorms. The day was spent sorting out the cooking situation, booking accommodation, and planning the next few days. This time also allowed for the first of the Summer Mountain Foundation (SMF) qualification lectures to be completed by our more junior members who were beginning their progression through the qualification system. On the second day the team began the first leg of the Mont Blanc Circuit. 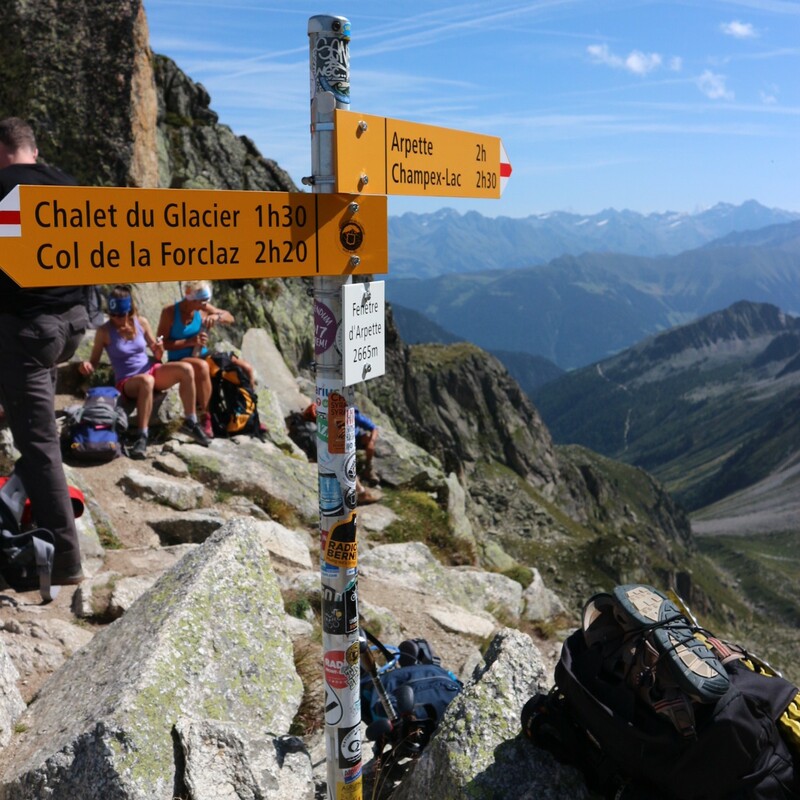 After setting off on the trail, we ascended for about 2 hours to reach the point of Col de Voza. After reaching this point amongst some rather impressive views of the alps, we began to descend the opposite side of the mountain, passing through multiple hamlets, wooded areas, and across streams. 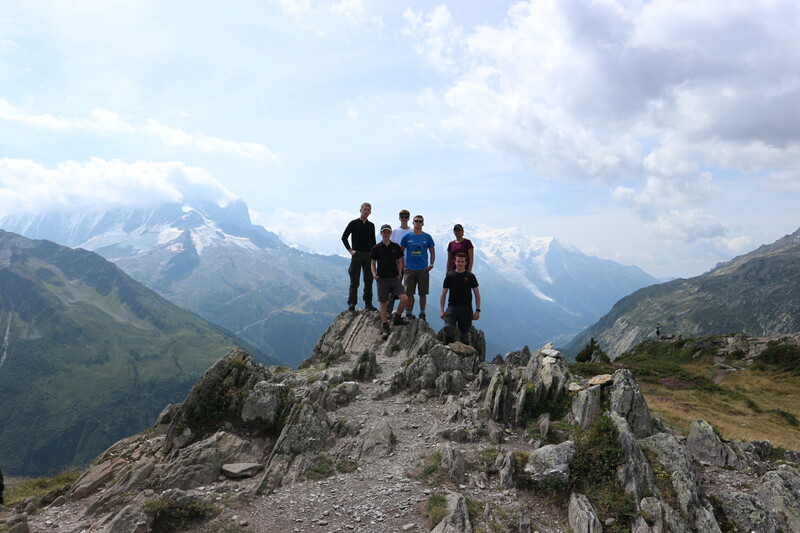 After a lot of small climbs and descents, we eventually arrived at Les Contamines at around 1200. A quick shop in the local Super Marché was followed by lunch at the campsite, before prepping for the next day and what it might bring to us. The route on the third day was a slightly shorter than before which meant that we could have a later start than usual. After about 5 hours of ascent, we reached the next Col and decided to have lunch, before beginning the descent back into the valley. Once reaching ground level, we spent an hour waiting in a refuge with a nice cup of tea to relax after the day’s hike, before attempting to set up camp. However, we were informed that the campsite was actually located on a floodplain, and given the recent weather and current forecast it was decided that it was much safer to move to a less disaster-prone site. The following morning saw the worst weather of our trip so far. As we climbed our ascent, the weather started to turn into light snow, hampering our speed and visibility. Safe to say that this was one of the low points of the trip in terms of morale! However due to the freak nature of this weather incident we decided it would be best to push on and, sure enough, after less than an hour, the weather subsided. We reached our peak of the day at the French-Italian border, marking our first mountaineering cross into another country. After many hours of undulating ground, we reached Refugio Monte-Bianco, our stop for the night. Lots of food and warm beds meant we had a great night’s rest before carrying on the next day. Whilst in the refuge, those undertaking the SMF qualification carried on with a few more lectures. This refuge was one of many key things paid for with the grant kindly given to us from the Ulysses Trust, and proved a vital in rebuilding morale and allowing the instructor to deliver the lectures required to qualify people with their SMF. We woke up the following day to some absolutely spectacular views of the mountain ranges at the refuge, and after breakfast, began a (relatively) small ascent of 400m, reaching our peak height quite early before moving on down the valley. Today proved to be rather flat terrain through Italy, with occasional undulation and persistently stunning views of the alpine ranges. It proved to be amazing weather throughout, breaking the murky cycle of rain that the exercise had been trapped in since day one, which everyone was very glad to see. Our sixth day marked our transition into Switzerland, which proved to be a shorter walk than most. 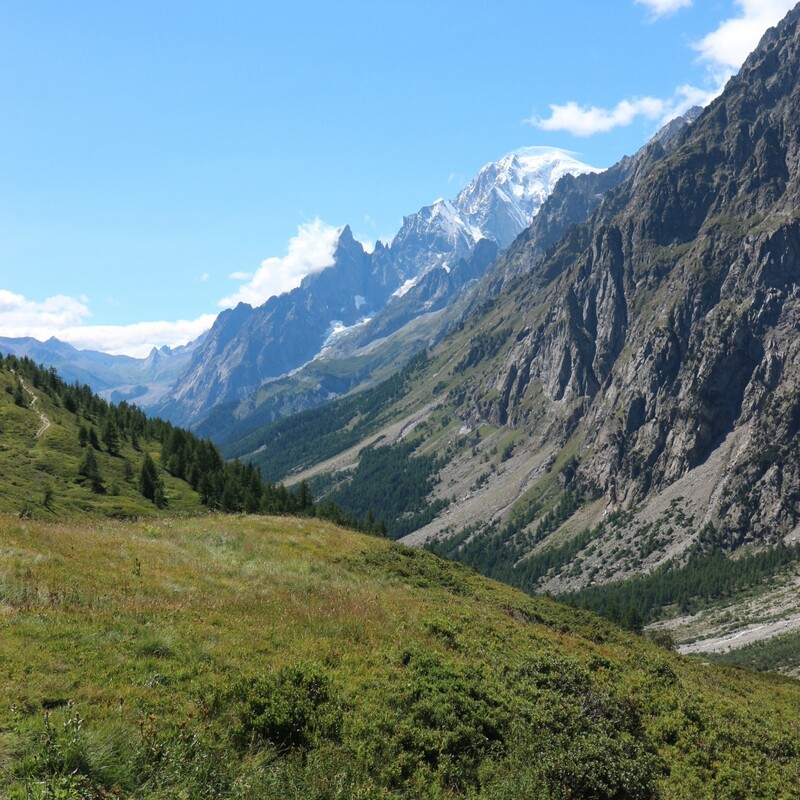 After climbing to the Col that represented the border between Italy and Switzerland, and seeing the price increase at a mountain café, we continued our journey through some rather picturesque alpine meadows, eventually reaching the town of La Fouly. Given our early finish, we decided to have a few drinks to celebrate Jenna’s birthday the next day, and were subsequently treated to a fun evening at a refuge near our campsite with Swiss music, a harmonica-off, and hats. Definitely an introduction to Switzerland that we wouldn’t be forgetting any time soon. On the seventh day of the tour the weather forecast consisted of a large thunderstorm, and so it was decided that a rest day would be a good idea for the team. Hence, the day was spent in Champex, relaxing at a swimming pool, eating lunch, and facing some locals in a few games of volleyball, which resulting in us losing almost every match. As a birthday treat, we also had some cheese and chocolate fondue later that night. The weather having cleared, the next day began with a 1000m ascent, culminating in a tough walk over boulder fields, which proved to be some of the toughest terrain we had faced on the Tour. 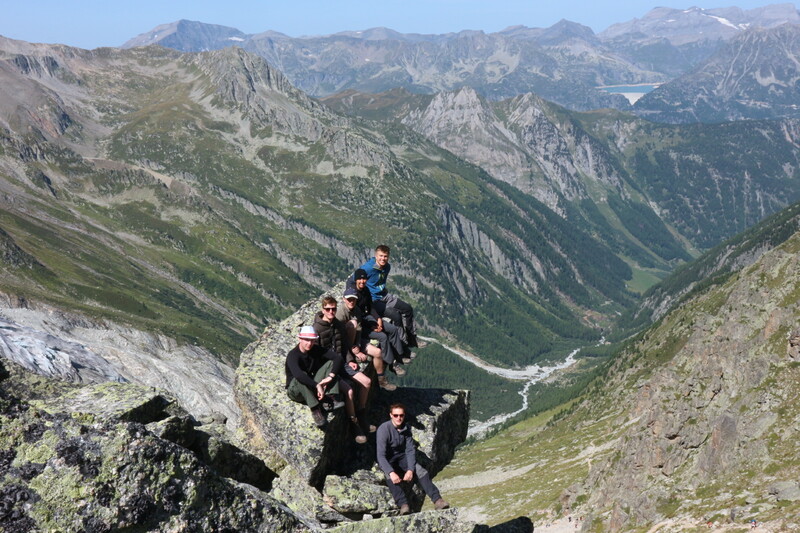 We eventually reached our highest point of the trip at 2600m, and had our lunch amongst a wide view of the Alps, followed by the obligatory group photo on an overhanging rock protrusion. After lunch, we began our descent down, the boulder-filled landscape slowly giving way to a wooded alpine environment. We had a small detour once we discovered that our intended path had been closed off, but soon found ourselves at our campsite after a long day’s walk. This was most likely one of, if not the most difficult day of the tour, but was equally rewarding with its exceptional views. 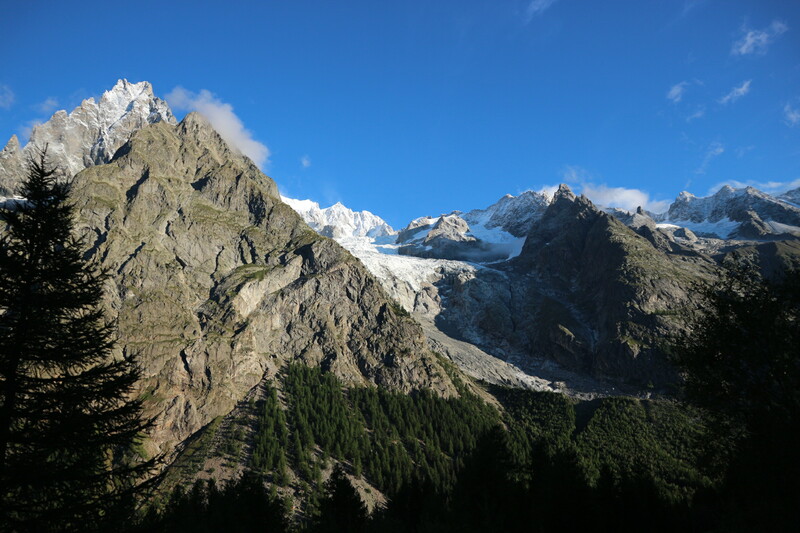 The following morning marked our return to France from Switzerland, returning to the Chamonix valley which offered a rather impressive view from the border. Although a rather short walk, today offered us the chance to go in to Chamonix for the afternoon, browsing the shops looking for more AT gear, and maybe grabbing a coffee at the much cheaper French prices! Tonight saw the last of the SMF lectures, and also the final test being completed by the participating bursars. Setting off from our campsite just outside of Tre-le-Champ, we had a 3 hour climb to reach today’s height, happily marked by a very tranquil lake, full of other walkers on the Tour enjoying the spectacular weather and relaxing by the lake for lunch, which proved a very relaxing sight near the end of the tour. Afterwards, we headed on to our refuge for the night, appreciating the opportunity for a proper bed again, before our final day of walking on the Tour. Our final day on the Tour was also one of our longer days, kicking off with a long ascent and the opportunity of lunch. This was quickly followed by one of the steepest descents on the Tour, and also resulted in us walking past a unit of the French Army, whom were having to climb this section of the tour in kit with rifles, which was certainly not envied by our group. After hours of hard descent; aptly described by Ocdt Cornish when he said, “although it’s taken 2 years off the lifespan of my knees, completing the Mont Blanc circuit is an achievement that I won’t forget anytime soon, and I look forward to doing another route in the alps soon” we finally found ourselves back in Les Houches, and the end of the Tour de Mont Blanc. After driving a couple of hours to Dijon to cut away at the next day’s journey, the team had an opportunity to celebrate the end of the Tour as a group, saw us all reflect on the challenge we had just completed. Today was a full day of travel. Having already cut out some of the journey by driving to Dijon the night before, we still spent the entire day driving back up through France to Calais. Despite the ferries being delayed due to poor weather at sea, we managed to get an earlier ferry, even though the amplified security at the port slowed things down. Arriving back in the UK saw a short drive back to Southampton, officially concluding the exercise. The exercise was a resounding success and fulfilled the objectives it had planned. The group learnt lots about working together as a team, in difficult and remote situations to overcome unseen problems. All members were also challenged in one way or another, be that physically or otherwise. This expedition while proving good fun for all participants and allowing those who needed it to gain SMF, and for those that already held the qualification, to gain more experience towards the next rung of the ladder. An extremely fun couple of weeks was had by all, and everyone is looking forward to doing similar mountaineering next year, and many have been inspired to run similar trips in upcoming years. 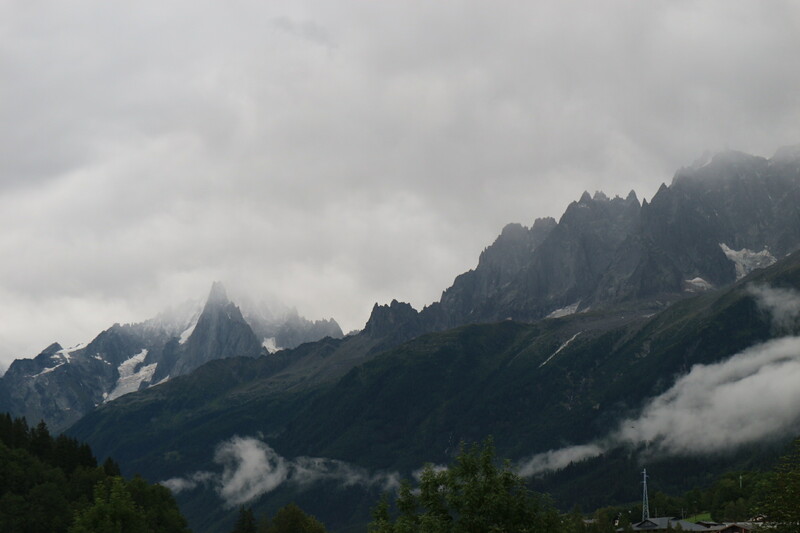 As the Weather cleared, and the clouds lifted we got our first glimpse of the magnificant Mont Blanc Massif. The epic view the group woke up to at Refugio Monte Bianco. The group stand at the highpoint on one of the legs through Italy. The group with Mont Blanc herself in the background, during their penultimate stage down the Chamonix Valley. The Obligatory Group photo at the high point of our Exped. The sign post marking the high point of the tour. The view down the Aosta Valley, which the group walked in just under 2 days.